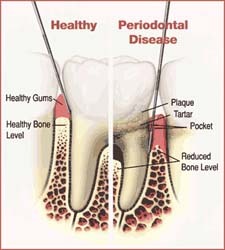 Gum disease is an inflammation of the gums that can progress to affect the bone that surrounds and supports your teeth. It is caused by the bacteria in plaque, a sticky, colorless film that constantly forms on your teeth. If not removed through daily brushing and flossing, plaque can build up and the bacteria infect not only your gums and teeth, but eventually the gum tissue and bone that support the teeth. Gingivitis : This is the earliest stage of gum disease, an inflammation of the gums caused by plaque build-up at the gumline. If daily brushing and flossing do not remove the plaque, it produces toxins (poisons) that can irritate the gum tissue, causing gingivitis. You may notice some bleeding during brushing and flossing. At this early stage in gum disease, damage can be reversed, since the bone and connective tissue that hold the teeth in place are not yet affected. Periodontitis : At this stage, the supporting bone and fibres that hold your teeth in place are irreversibly damaged. Your gums may begin to form a pocket below the gumline, which traps food and plaque. Proper dental treatment and improved home care can usually help prevent further damage. Advanced Periodontitis : In this final stage of gum disease, the fibres and bone supporting your teeth are destroyed, which can cause your teeth to shift or loosen. This can affect your bite and, if aggressive treatment can't save them, teeth may need to be removed. Our office offers surgical and non-surgical treatment of gum diseases. Depending on the nature and extent of the periodontal disease, Dr. Morales will recommend the proper course of therapy that would produce the optimum results. 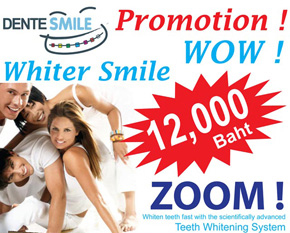 The removal of hard and soft deposits from tooth surfaces. These deposits (Plaque and Calculus [tartar]) cause irritation and infection of the gums and bone loss around the teeth. Scaling and Root Planning requires the use of ultrasonic and hand instruments for proper removal of plaque and calculus and is usually performed under local anesthesia. This surgical procedure replaces bone that has been lost around the teeth as a result of advancing gum disease. Various types of bone grafting materials are used including synthetically derived bone, the patient's own bone, or non-human freeze-dried bone. Often a "membrane" or "barrier" is used to help contain the graft within the prepared bone site and help the graft to heal properly. Regenerative membranes are proven solutions to periodontal disease. They are specifically designed to help preserve your natural teeth through guided tissue regeneration therapy. The membrane is surgically placed around your tooth and forms a protective barrier which allows your body to naturally regenerate new, healthy tissues. It takes approximately 6 to 10 weeks for the body to heal itself and the attachments holding your tooth in place to grow back. A surgical procedure designed to add "protective" gum around the root of a tooth. Protective gum is often lost as a result of recession of the gum or trauma. Most often, the protective gum used for the graft is taken from another area of the patients own mouth where the protective-type gum is abundant. This may also be done with donor tissue, in some cases. Once the graft heals, the area will continually maintain the new protective gum. Gum grafts are very predictable and usually need to be done only once. A large percentage of our practice is devoted to cosmetic periodontal surgery. This type of surgery consists of cosmetically enhancing the gums (gingiva) and/or jaw bone to create a more pleasing smile. We usually work closely with your dentist to create the "perfect" smile. These types of gum grafts are designed to cover the roots of teeth that have been exposed due to recession or trauma. These procedures are often done as cosmetic procedures in areas of esthetic concern. This surgical procedure is designed to assist your restorative dentist in getting a restoration (cap or filling) to properly fit your tooth. When decay or tooth fracture extends beyond the gum line, your dentist may require more tooth structure be exposed so that he or she may properly restore the tooth. This procedure may also be done to improve a "gummy" smile as a cosmetic procedure. Dr. Morales has advanced training in surgical placement of dental implants and the bone grafting procedures that may be required for successful placement. When a tooth needs to be removed due to infection it is not uncommon to have lost bone from around the infected tooth. In these cases various types of bone grafting can be done at the same time the tooth is removed to facilitate the placement of a dental implant at a later date. Once your dental implant restoration is completed it is important to keep the area clean and infection free. Dental implants can accumulate plaque and tartar just as teeth can. Whether you have just one tooth replaced by an implant or several a professional cleaning schedule will be necessary to keep your implants healthy. The time interval for these professional cleanings will be determined by your individual needs.